Many of our customers have questions about their props... Aluminum vs. Stainless, diameter vs. pitch, etc. So here's a little "crash course" on boat performance as it relates to props... Please don't take the "crash" part literally! The easiest way to find out what prop you have is look it up. The number is usually found on the exhaust side of the hub for stern drives and outboards, or it may be stamped on the outside between the blades. If you want to check if we have a prop in stock, the easiest was is to give us the number stamped on your existing prop. Alphabetically, diameter comes before pitch. So a 14x19 is a 14" diameter 19" pitch prop. In this example, the circle of a full rotation is a 14" diameter, or double the radius (measured from the center of the hub to the farthest edge of one blade). The 19" pitch is the measurement of how far the prop would travel through solid material in one revolution (similar to how a screw moves through wood). Pitch is theoretical, because the slip effect in water reduces this number. How much slip depends on the design of the boat and the prop. But without slip, you'd need a clutch when you tried to engage your drive, so this isn't necessarily a bad thing. So now you're thinking if you change your 17 pitch prop to a 19 pitch, you'll go faster! This is true at top end. But you'll lose low-end performance. It's give and take. Picture leaving a stop sign in second or third gear: you can do it, but it'll take longer to get your car going. Higher pitch will help at top end, but lower pitch offers better acceleration and less slip starting off, getting you up on plane faster. You'll get out of the hole quicker with a lower pitch prop, but you'll lose top end speed. How you use your boat will help you determine if the prop you have is right for you. If you travel a lot with your boat and want to make good time with better fuel economy on long runs, higher pitch is ideal for after getting your boat up to speed. If you start and stop a lot, lower pitch gives better performance for water sports (if you do a lot of skiing or tubing). The lower the pitch, the more power is transferred from engine to prop with less slippage. Boat manufacturers usually specify a range of options that are right for your boat. You want to stay within this range. Too low a diameter or pitch may cause "over revving" and too high a pitch could cause lugging at wide-open throttle. Increasing pitch drops RPM, and decreasing pitch increases RPM. Diameter also has an effect on RPM, but not as much as pitch does. If you increase pitch, you may consider a slight decrease in diameter. The prop pictured above is a modular style. 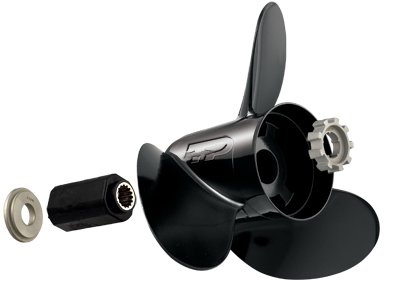 Changeable hub prop systems from Turning Point, Michigan Wheel, Mercruiser/Quicksilver and Solas allow you to exchange different props with the same hub. There are several benefits. One is if you damage just the prop blades or just the hub, you don't have to replace the whole prop, which saves money. Another is you can buy two different props and exchange one hub between them. This is beneficial if you use your boat for both long trips and water sports. You don't have to give up performance for either, and you don't have to spend as much for two standard props to get the two different pitches you need. If you have a standard aluminum prop now, a stainless prop could offer slightly better performance because stainless is more rigid and doesn't flex as much, but pricing is higher, both when purchasing and repairing. It's also a good idea to keep a spare prop on board. The "perfect size" isn't as important for your spare, so consider buying a reconditioned prop or having your old prop repaired. Along with new props, we offer both prop repair services and reconditioned props for sale. Not having a spare prop on your boat is like driving your car without a spare tire. And being out in the water with a propeller that won't get you home could mean a very long wait or an expensive towing bill. A spare prop and a prop wrench to change it are inexpensive insurance. Keep your boating enjoyable, and don't get stuck out on the water.